Includes notes on: the coal mining industry, the British Empire, 'The Fight for Oil', the Monroe Doctrine, Tory Higher Rates Scheme, and 'Facts of Capitalism'. Also quotes from, amongst others, the Daily Herald, Manchester Guardian, T.U. Leaders and History of Labour Representatives. 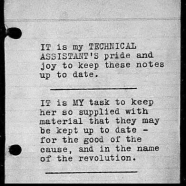 Notebooks with typed quotations and information.